Weight: I weighed her the other day and the scale said 9.5 lbs. We go to the doctor tomorrow so we will get her weight on a better scale! Height: I'd say around 21 inches..tomorrow we will know! Clothing Size: She is still wearing newborn clothes. 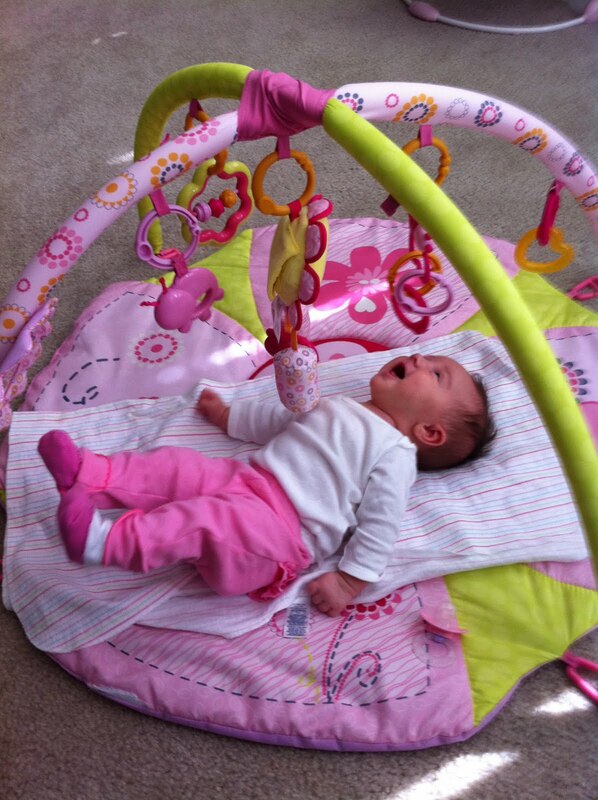 None of her 0-3 month clothes fit quite yet, we are trying to fatten her up so she can start gettin' dolled up! Diapers: Still wearing newborn diapers. Hopefully she will move up soon because we are running out of NB and have a $h!t ton of size 1 diapers! We just switched her formula from the Enfamil Soy to the Similac Soy and she seems to be doing a little better, no stomach problems...yet. We have an appointment in the morning to see if she has acid reflux or not. Hair/Eyes: She still has a decent amount of hair, it's just getting a little lighter. So far no bald spots in the back either! Her eyes are still blue but I am sure they'll turn. Adam and I both have green eyes! Sleep: Still sleeping most of the day. She wakes up for a little bit in the morning and then again around 7:00 at night, but always goes back to sleep. Adam brings her to bed around 1:30 or 2:00, she wakes up around 5 or 6 to feed, then again around 8 or 9. We usually get up after that and start our day! Favorites: She loves bath time..but hates getting out and being naked! And every night, it never fails, she get's out of the bath and I put her on the changing table to get her pajamas on..and she pees. Every. Single. Time. She also loves her little vibrating chair. She gets in there and immediately goes to sleep! We just started putting her under her little mat thingy-ma-jig that has little thingy-ma-bobs hanging from it and she really likes that..until she spits up all over herself and I don't know it and all of a sudden she has puke in her hair, ears, and neck rolls...but that's neither here nor there...she loves the mat...that's all that matters. Fun stuff: This weekend we are going up to Huntsville to visit with my Dad and Melissa! Adam also has a golf tournament on Saturday so he will be gone for most of the day for that. I'm sure we will hang out on the boat for a little while...OH SNAP! Presley doesn't have a bathing suit?!!?! I think I smell a shopping trip before we go! On a totally different note, I went back to work last Thursday. Not for good, but just for two weeks until Adam starts back to school. We figured that since he is able to stay home and watch the baby, I might as well go back and make a little money..and let's get real..I really needed to get out and socialize more! I find myself talking to my kid who doesn't care if we watch Dance Moms or True Life..but I ask her anyways because there's nobody else to talk to (Adam does go work out everyday, otherwise I'd talk to him!). I am only working from 10-2 everyday and it's perfect! I wouldn't mind just working part time when I go back, but that's not really an option I don't think. I think I am more excited about going back to work because that means Adam has night time duty! I get 8 hours of sleep, go to work, come home and make dinner! Ok, well the little peanut is getting antsy...gotta feed her and get ready for the Bachelor Pad!! Happy One Month Lil P! 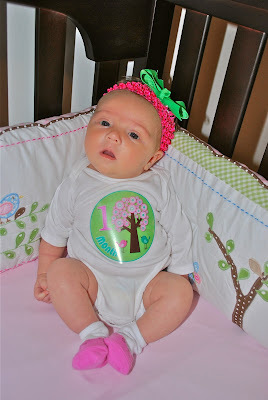 :) - Love your blogging baby friend, Olivia (and her Mommy, Laura) xo She's such a cutie! 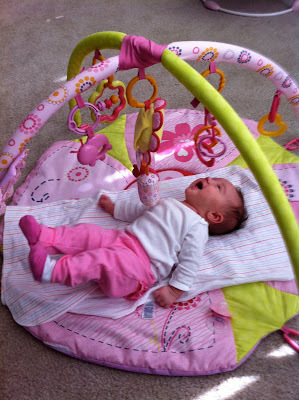 Such a sweetypie I cant beleive its beena a month already! And my little nephw is 4 months old and LOVES his vibrating chair! Congrats! Your baby is beautiful!